At UrbanMeisters continuously strive to keep you updated with the latest trends in sustainability covering all lifestyle spaces of fashion, fitness, food, lifestyle, home, work & also art. We’re happy to see how sustainability is slowly firing the imagination of plenty of artists either by the message they give out through artworks or the materials used to create them. Up-cycling is an established trend in contemporary design and art as covered frequently in our previously presented monthly column SUNDAY GREEN ART DIGEST. We presented hand picked sustainable art projects from around the world, be it Bel & Bel’s innovative furniture made by up-cycling vintage scrapped cars, or Boris Bally and his quirky re-use of old traffic signs for decorative and functional purposes, or Times Top 100 listed green artist Rodney Allen Trice and his unconventional and hard hitting art design pieces from discarded waste. We continue to cover green art movement and are excited to present another talented up-cycling artist making quite a statement- Bruno Lefevre-Brauer. We’re the first to cover his new series currently at display at the prestigious M.A.D. Art Gallery Dubai. Bruno Lefevre-Brauer, known as + Brauer, is a graphic designer living in Paris. 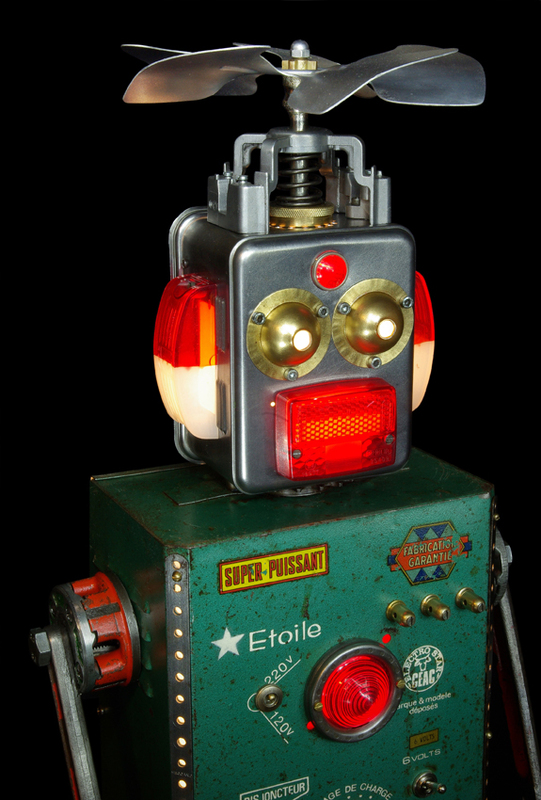 His latest venture is an art project involving robots created from oddments of vintage and industrial objects. His art and design with sustainable methods and techniques is a scathing commentary on the consumption driven society or as Bruno Lefevre-Brauer says it, a ‘poetic resistance to mass-consumption’. 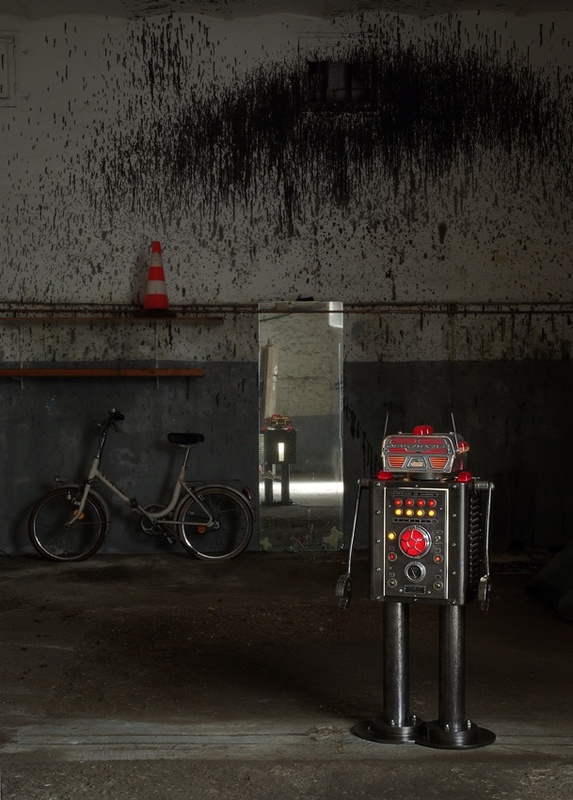 Giving a new life to discarded and abandoned industrial parts form workshops and garages, Bruno Lefevre-Brauer’s robots are not the new age ‘bots’ but almost primitive prototypes of AI imagination. And we’re excited to be one of the first to exclusively introduce Bruno Lefevre-Brauer’s new series. Here is an inspiring peak inside the artists mind as he shares his, inspiration, roots and philosophy with us and an exclusive peak into his new series-‘Viva la Roboluciòn!’ & a sneak preview of his newest robot- Voltmatic. In conversation with Bruno Lefevre-Brauer! Hello Bruno Lefevre-Brauer, could you tell us a bit about what you were upto before you started with your very cool robotic sculptures? I graduated in arts and graphic design and have been working as a graphic designer for over 20 years. I’ve always maintained an artistic activity alongside my job, through sculpture and paintings. My sources of inspiration are many. I appreciate the atmospheres of Bauhaus, constructivism, industrial architecture … but also those of Méliès, Jules Verne, Tinguely’s machines, science fiction, its utopias and extraordinary journeys. How & when did this robotic romance begin? I’ve always been attracted by industrial materials. They inspire me. My work as a sculptor has always associated rough material and light. I’ve been creating lamps from recycled materials (metal and glass) for 2 decades. 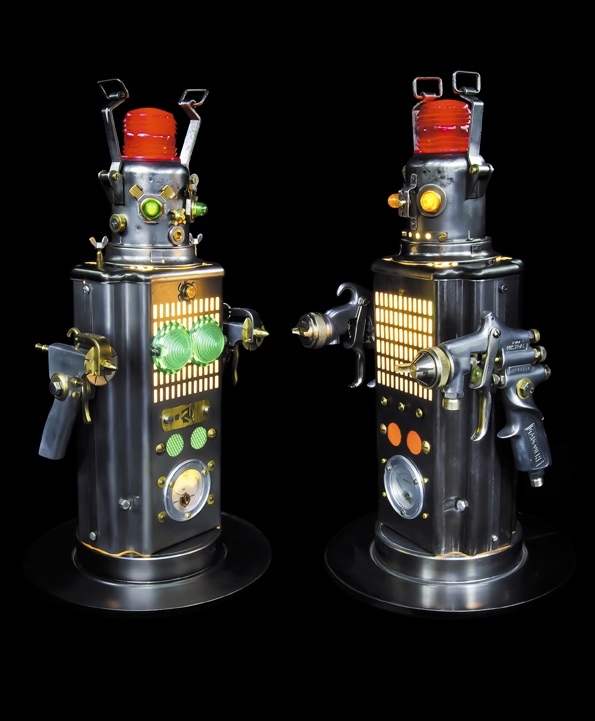 About 10 years ago, I started exploring the Robot theme through my sculptures. 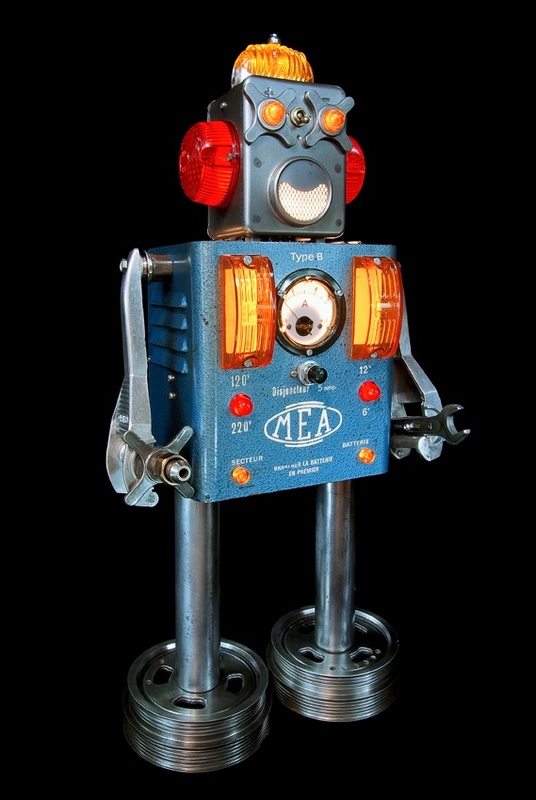 My first robot was a simple metal case, topped by an insulator, with keys as arms. It actually was a minimalist version of a robot! The shapes of my sculptures have evolved a lot since that time. Thanks to the complexity of assembling recycled materials together with lights, I’ve developped new techniques and experienced new methods to obtain the result I’m looking for. This is how many new robots came along and started expanding this family. As a child, my imagination was struck by Science Fiction stories. The Robot, as described in these stories, with its nearly human feelings, influenced me a lot. We notice that all your robots have quirky names almost giving them a human touch. Do you have a philosophy on why these names & how you go about christening them? Humanize, certainly. Each one of my robots has its own personality and name. Like Geppetto, I like to see the personality of each new robot. While working on a new robot, while building its shape, I tell myself its / his personal story. Its / his personality arises little by little, out of my imagination. The light is like the robot’s soul. Each sculpture looks different whether it is on or off. Metal and light are inseparable for me. I don’t want them to be cold machines, but rather the friends we love to have close to us. The name comes at the end, as a completion! We’d love to know which one is your favourite one? Ours is Bonnie Clyde above! Any special personal anecdote around any of them? None of them really is my favorite. In a way, they all are a bit like my children! Each one has its own personality and story. VIRGILE: With his body branded « National Gendarmerie », he is one of the tallest robots ever created by +Brauer. His high stature makes him a natural giant guardian for his fellow robots. CHAMPION: A vintage battery charger from the 60’s for a body, a head made out of a fireman’s box, tools in both hands… He’s ready to step in for any emergency. JIMMY: Small and quick, he is always standing in front line to secure the way. He is proud to say that VIRGILE is his cousin, and that he will call him for help if anyone dares to annoy him. GASTON: He is a knight. He has travelled a lot and knows the complete universe. He has always returned safe from all his missions and is know spending his time resting in a home that fits his rank. How & where do you collect material to make these? What’s the most common waste item you come across? I mainly use materials that once had an industrial function. For years, I’ve been retrieving, sorting, ordering and storing parts. It is necessary to go through this, in order to be able to create with more freedom. I find them In flea markets, waste sites, garages, through barter… I’m fortunate enough to have collected a stock in a family car garage some time ago. I also recycle abandoned objects that I find in the streets, that people who know my work bring me. Despite this important collection, it sometimes take me a lot of time to find THE missing piece, the one that will allow me to finish one robot. The main challenge is to assemble materials that are not meant to be put together. Each part reveals its own constraints. Associating a lighting scenary to it makes the task even more complicated. I must go through many tests before implementing the electrical part that completes the sculpture. I wouldn’t describe my work as functional art. 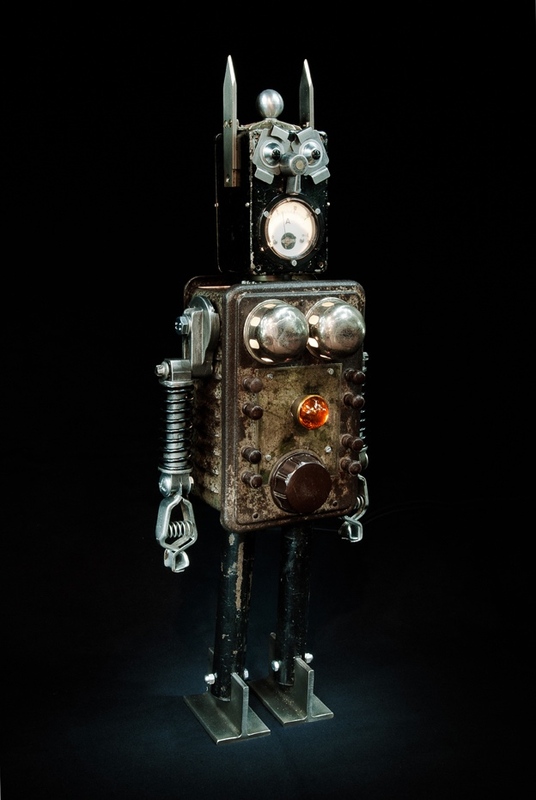 As a matter of fact, none of my buyers see their robot as a functional object, but rather as a favorable presence, a part of their daily family life. I’ve received many such feedbacks from different buyers. All my sculptures include highlighting, as I see the light as my robots’ soul. Although the setting up of lights in the robots makes the creating and making a lot more difficult, I cannot imagine anyone of my robots without a light, without a soul. But they are not designed to be lamps, and none of them is even bright enough to light a room. Can you tell us a bit about your past shows, people’s response? I’m fortunate enough to exhibit in different parts of the world (France, Switzerland, Spain, The Netherlands, Taiwan, Dubai …) and to meet very diverse people. But most of all are concerned with the environmental problem. My work and its playful approach allow us very often to start a dialogue on this subject. However, though they appreciate the reuse of old industrial material in a sculpture, none of my buyers had in mind the doing a green act when they decided to purchase one of them. What’s your green motto? And any advice to other green artists..? “Viva la Roboluciòn !” as the rallying cry of a poetic and peaceful army. 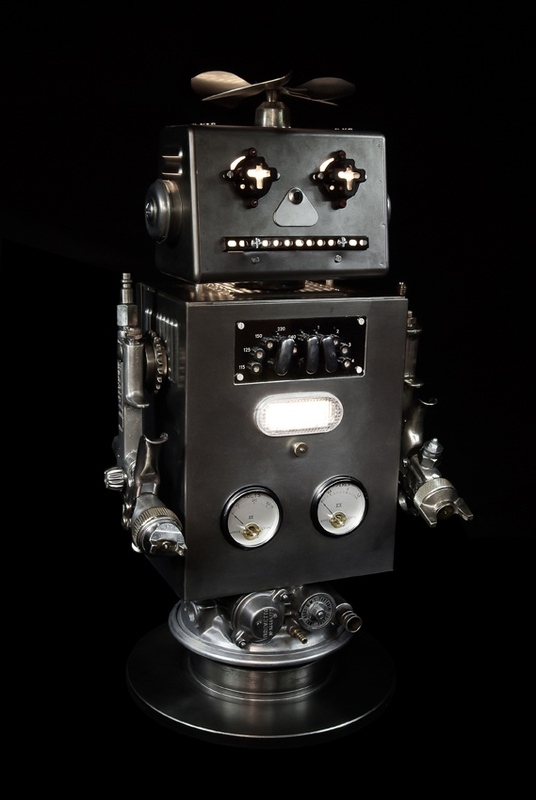 My robots are made ​​from previously used industrial materials that are now obsolete. I reuse these materials by sublimating them. If each piece is different, all these robots put together create a unit, a ‘family’, a peaceful army that fights against obsolescence. The idea is to show that we can reuse objects rather than throwing them away — reuse, recycle. This is my poetic resistance to overconsumption. One of the main idea of recycling, is awareness. Our modern world emphasises the “disposable” and produces tons of waste that have little or no reuse. My approach goes against this trend by diverting objects from their primary function and inventing them a new life. To me, waste is a wound to the planet, but also an inexhaustible source for imagination. It’s up to us to reinvent waste ! 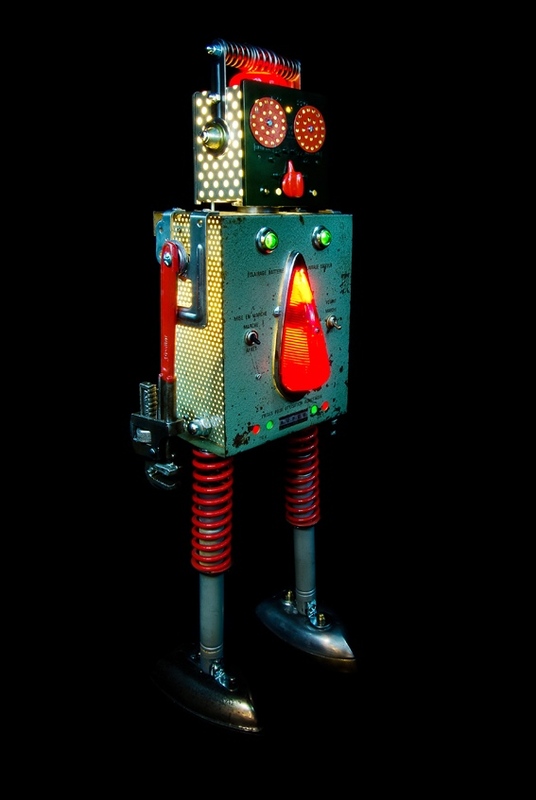 In our modern world, robots are being serialized from new materials. I wanted to create “Viva la Roboluciòn !” as a series of unique robots and all made from previously used materials. Only one advice : use your creativity ! Every waste can be used. I think the environmental problem is not soon to be settled. I hope recycling artists will continue to amaze with their creativity and thus raise the widest possible audience. I have long wanted to go on a road trip through Eastern Europe, a recent stay in Berlin allowed me to see that there are still many wonderful discarded objects to find there. ‘Viva la roboclucion’ is certainly creating huge waves in the field of premium sustainable Design & Art UrbanMeisters. 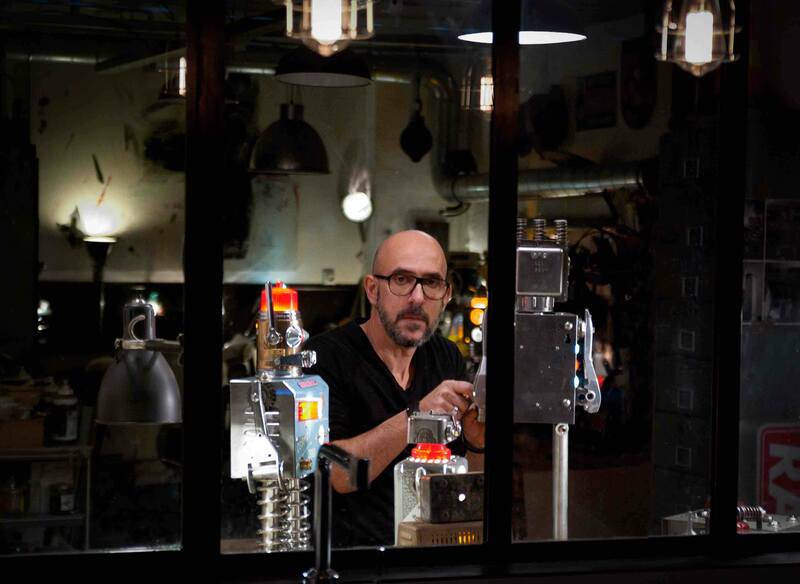 We loved the innovative craftsmanship and artistic vision of Bruno Lefevre-Brauer, if you did too then you can learn more about the artist or discover more of his art on his website. Art has a big role to play in bringing about change & change makers like Bruno Lefevre-Brauer are at it. It’s our turn as consumers to heed this message and appreciate the beauty. Viva la green art!